St. Mary’s University senior Cameron “Alex” Martinez has forged a path that allows him to embrace military tradition, ambition, humility and unexpected change. A member of the St. Mary’s Reserve Officer Training Corps (ROTC), Martinez will be commissioned in May as a first lieutenant. But he’s already hit a major accomplishment in his young military career — earning U.S. Army Cadet Command’s designation as the No. 3 ROTC cadet in the nation in 2019. The U.S. Army Cadet Command annually ranks seniors in ROTC programs based on GPA, physical fitness, ROTC training performance, extracurricular activities and more. Fewer than 1 percent of Americans serve in the military, said Lt. Col. Julian Perez, Chair and Professor of Military Science at St. Mary’s. That puts Martinez in an even more elite group by making the top three out of 5,527 cadets nationwide, he added. Martinez excelled in all categories with a GPA nearing 4.0, an Army Physical Fitness Test perfect score, selection for leadership programs and high performance in athletic competitions. He’s also the top-ranking cadet of civilian colleges nationwide; the top two cadets attend Virginia Military Institute and The Citadel in South Carolina. Growing up in Amarillo in a family deep-seated with military tradition, Martinez knew he wanted to join. His father and uncle both served in the Army. His grandfathers served in the Navy and Air Force. Martinez and his brother, Zane, also a St. Mary’s cadet, were raised by a single father until age 8 and 7, respectively, when their father died from cancer. “We were very blessed to get adopted by our own uncle and aunt. Had we gone through the foster system, there is no telling where we could be right now,” Alex Martinez said. The couple helped the brothers attend a college prep school at which Martinez learned time management and how to balance academics and extracurriculars — critical to his success in ROTC. Uncertain if he would receive a college ROTC scholarship, Martinez enlisted in the Army at age 17 and went through basic training before his high school senior year. But three colleges offered him ROTC scholarships, and he picked St. Mary’s. 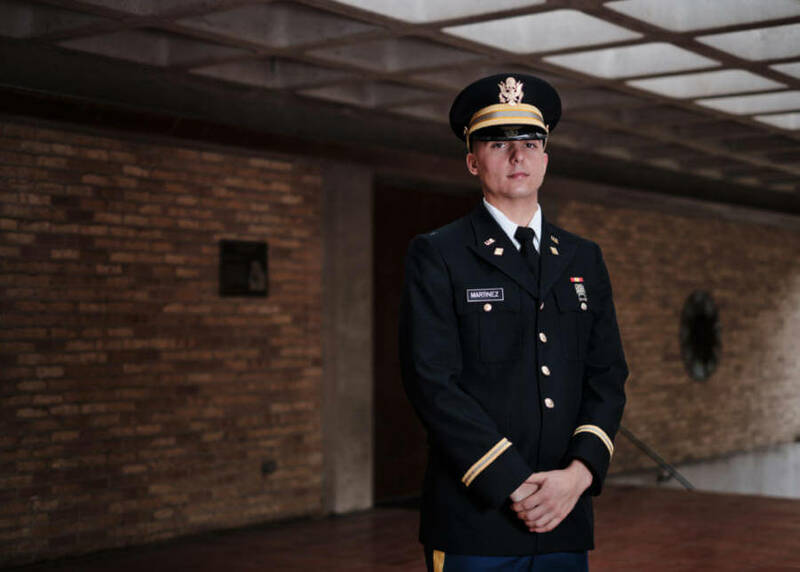 When the Finance and Risk Management major is commissioned in May, he will begin a career as a finance officer, whose roles range from overseeing currency exchanges to purchasing supplies and services necessary to complete a mission.